If R100 is the original CandOhm metal resistor, then you're better off without it. They were lousy to begin with. I restored an nearly identical 48-1001 Philco and the CandOhm in mine failed as well. Just go higher watt rating (double?) on the replacements and you'll be fine. The hollow core Ohmites run hot anyways, IIRC. I'm concerned now about overheating. These resistors will be dissipating a lot of heat into the underside of the chassis, which is an enclosed space. The original dumped the heat into the chassis, using it as a heat sink, but that's gone now. Do I run the risk of overheating here? Could it cause a fire? If you want to transfer heat onto the chassis, the aluminum body style resistors mentioned earlier are going to perform about as close to the originals as possible. For better heat transfer you can add silicon heat sink compound between the resistors and chassis. Even the 50 watt unit listed below shouldn't be physically too large to fit under your chassis. The other two resistors could be 25 watt or even smaller units. The larger sizes will dissipate away the heat most efficiently (it's all about surface area and air movement). The values can be off 20% and still work fine. File comment: Ordered from Mouser. Ok but we're you able to watch a program? Decent video plus audio? Or is there another still unresolved issue going on that's preventing normal operation (and safety)??? I've hooked up the higher-watt (25 and 50 watt) resistors, and they get just as hot as the lower-watt (10 and 20 watt) resistors. I believe that all of these wattages are high enough, correct? If so then which I use comes down to how I think I can install them for best heat management. The lower-wattage ones can be attached to a terminal strip and be free in the air to dissipate heat. The higher-wattage ones would allow me to attach them to the chassis with conducting gel between, dumping heat into the metal chassis, but that entails drilling holes in the chassis, which is difficult. File comment: High-watters are jumpered in the lower watters are on the bench. File comment: This is about where any resistors would need to go, whether in air or attached to the chassis. I can remove the old R100 to free up space. if 20 watt resistors are getting super hot obviously something in that circuit is drawing to much current and that needs to be corrected. 20 watt is obviously high enough rating and shouldn't be getting that hot. some troubleshooting in the circuit is obviously necessary to find the problem then it must be corrected. Since the original resistor sections were attached to the chassis and dissipated heat to it, I recommend that you do the same with the replacements. I am impressed with your progress and perseverance with your Philco set, you have done some excellent work. I, too, am quite impressed with your workmanship and perserverence. You may recall I was the very first to respond to this thread imploring you to start somewhere else, tv-wise. You've proven yourself most worthy. Well done. Those new higher wattage resistors are not much bigger than the lower wattage resistors. So I expect that they get their higher ratings by being designed to be attached to some metal to act as a heat sink and possibly being made of materials that can run hot without damage. Certainly attach them to the chassis. Thanks guys. If I go with the higher-wattage resistors, I was planning to attach them to the chassis as designed. If I go with those, I will find a way to do that. The bigger issue that has been pointed out is that something is dumping too much current into that circuit. My plan is to solder in the smaller-watt resistors temporarily, so I can work with the set without all the jumpers. Once the TV is working again, I'll re-evaluate the heat situation and decide whether to switch to the chassis-mounted resistors. M3-SRT8 - I remember the first posts. I loved the picture you posted. Many people warned me away from this project but as I'm in it for fun and nostalgia, not profit (certainly not that! - I could have had a new big screen with what I've spent on this baby) I had little to lose. It's been a sometimes-frustrating but ultimately enjoyable and rewarding project. I hope to have it all back together as a working Television set, electronics and cabinet and all, in 2017. Good news - I'm back to having watchable picture and sound. It's not as good as early December (see the Match Game video at https://www.icloud.com/sharedalbum/#B0f5n8hH4m5dr7) but it's not too far off. More good news - the thermal problem is gone. The sound stays the same no matter how long I leave the set on. I played The Day the Earth Stood Still and the sound never dimmed. To get to this point I found that C332 was not attached properly - bad solder joint. That got the picture back. The sound only came back when I adjusted the tuner cartridge screw, and I had to adjust it quite a bit. - Fine tuning control, the one on the front that's on the same control as contrast. In one of the recent videos, from today (2/4/17), you can see me working these controls, and see/hear some of the effects. What I've found is that if I adjust so that the sound is good, strong and clear with little buzz, the picture is grainy. If I adjust the picture so that it is clear, it and the sound are very dim. Shouldn't these be more "aligned" - i.e. good together, or bad together, not so separately? Often I find that some of the better results require things like the contrast, volume and other controls to be turned almost all the way clockwise. Shouldn't the set be able to operate without them being so "maxed"? See the videos of The Day the Earth Stood Still - there are columns of bright scan lines that fade in and out. What the heck are these? They haven't occurred with other DVDs. I need your help. What is the best way to approach the fine tuning of the performance of this set? Does it look like there are still electrical issues? What would you do next, if anything? Or would you call it done and live with it like this? File comment: Anything wrong you can see in this antenna setup? It's FM antenna wire - is that ok or would that cause reception issues vs. some sort of TV-specific antenna wire? File comment: This seems to be sort of a "big" fine-tuning control. Too much and it makes things contrasty and snowy. But adjusting this down until the picture is very clear, gives picture and sound that are also very dim. File comment: I use this on 75. Setting it to 1K makes things brighter and louder, but it seems to be "too much" signal - bleeds, too much contrast, snowy. File comment: This seems to be a finer-grained fine-tuning control. There is a very small "sweet spot" where the sound is the least buzzy, loud enough, decent picture, etc. File comment: I've got these about where they were originally. They don't seem to have a huge effect so I'm not too concerned. Should I be too concerned? Could these be having a big effect? File comment: Looks ok, not too bad. Much dimmer than the picture makes it appear though. File comment: Indication of current picture quality. Pretty good, but snowy/wavy, not smooth and perfectly clear. You can also eliminate copy guard - macrovision buy copying the dvd disc to another blank disc utilizing programs such as "DVD Shrink" etc. I've never seen copy guard lines on any disc I copied on my computer. Thanks guys. I just ordered a Grex stabilizer from amazon - https://www.amazon.com/gp/product/B0096I2DNE/ref=od_aui_detailpages00?ie=UTF8&psc=1. - Broadcast TV - looks pretty good, a little snowy/contrasty, and the sound is a bit buzzy, but very watchable. The snow in the background of "The Day the Earth Stood Still" looks like interference from a switching power supply, probably from the DVD player as well. Move it as far away from your TV as possible and preferably plugged into a different AC outlet and the sparkly "snow" might go away. -Your "FM" antenna cable is fine; it is essentially the same (300 ohm balanced wire) as "TV" antenna cable was in the past. -The 75 ohm switch setting you chose is the correct one. The higher one is used only when two or more video devices are connected to the same input signal. VHS - lousy video, it's bent at the top and wavy, but the sound is perfect. Similar answer to the one about Macrovision interference. 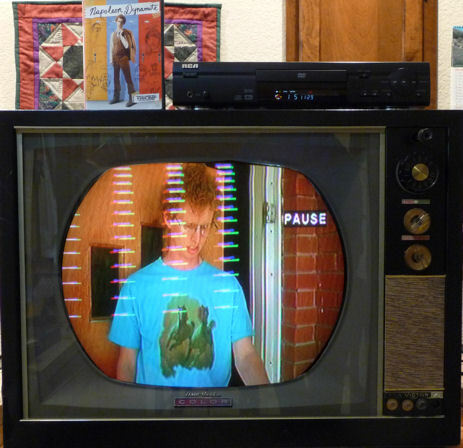 Many old TVs suffer from "wavy top" syndrome when playing VHS tapes. Nothing is wrong with your TV; it just can't handle what your VHS player puts out. 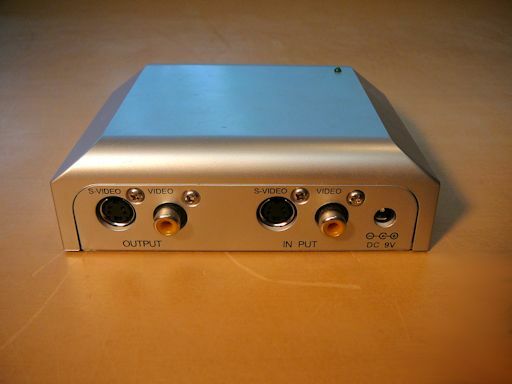 A home transmitter won't give you better quality than a direct wired connection to a DVD player. It might even be slightly worse, since the transmitted signal has to travel through the air rather than through a wire that's shielded from outside interference. An average home has many potential sources of RF interference, including computer power supplies, fluorescent bulbs, dimmers, etc., and those can affect the transmitter's signal. For me, the big attraction of a home transmitter is that you can locate your vintage TVs wherever you like in the house, rather than being tied to the source with a cable. good job so far fixing this tv. you are almost done. things i would do if it was mine is put a test pattern on the screen and adjust the centering brightness contrast and linearity. you also may need to adjust the agc according to instructions..
Congratulations on the progress so far on the 48-1000. I've been off this forum for some time now so I haven't followed your restore as it went. Over thirty pages! I might suggest the in the future you use more spaghetti ( tubing) on the leads of parts and wire joints, as you rotate the chassis upright the weight of the components may shift the wires and cause shorts.It's always as good idea to place power resistors on something that can take the heat when experimenting. Whether it catches something on fire isn't the best way to find out if something is overheating. Tracking down problems like sound and picture not tuning together starts to get into the area where you would probably need more equipment like a scope and sweep generator to make alignment adjustments.